Babies grow so fast and their feet grow even faster, or so it seems! Just when you breathe a sigh of relief that you have shoes for them for a season or two, before you know it they need a new pair. This isn't a big deal for Baby T, he has 6 older boy cousins! Baby E on the other hand, she is the little princess among all the princes, so I'm always looking for shoes for her and we like to stick to very few pairs of nice quality. Instead of five pairs that are cheap, she may have just one pair of sandals and one pair of Mary Janes that she wears all the time and that are comfortable. She was filled with joy at receiving the Natalia shoes from Umi's new spring/summer line. Baby T got the rugged Zander shoes to outfit him for his spring, summer, and fall adventures. Baby E absolutely loves the classic pink Natalia sandals. Okay, so she loves anything pink, I admit. But she does wake up in the morning and the first thing she does is put these shoes on since I don't allow her to wear them outside in below freezing weather! Can't blame her. I give her the excuse of 'breaking them in' before spring arrives. If and when eventually spring arrives, she'll be wearing these with some tights and barefoot in the summer. I can't try them on, but she insists they are very comfortable! The fresh styles from Umi for 2013 are absolutely gorgeous and I don't want to spoil it for you, check it out and see for yourself. It's hard to make just one choice! The girls espadrilles are beautiful, and the canvas print Mary Janes? Don't get me started. Having a girl is hard, girl's shoes are just too cute! Umi has great styles for boys as well, the oxfords and sneakers are super stylish. 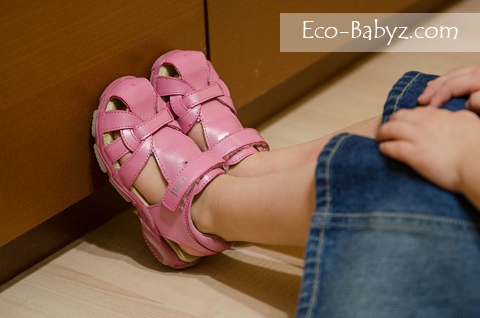 The Zander shoes that Baby T is trying on here are perfect for some exploration outdoors. They are rugged and bulletproof, for all the things little boys like to do. We are huge fans of Umi shoes and love the new styles they come up with each season. One thing that I would love to see them explore in the future is the possibility of minimalist (or 'barefoot') children's shoes. Those are so hard to find, but I would love to have more options for flexible-sole shoes for older children, not just babies. It's a niche that hasn't really been filled yet in the world of kids shoes. Disclaimer: I did not receive payment for this post. I was provided a sample of the product for review purposes. All opinions are genuine and my own. May contain affiliate links that support Eco-Babyz at no cost to you. I like the Carrter shoes with Black and Blue! I love the Zander in Gray Multi, so cute! Thanks for the opportunity!!! I like the Giselle sandals. I love the colors and neutrality of the Benet. It's in the Toddler boys section, but could be used for boys and girls - gender neutral. Woohoo! I have been eyeing Karolina in pink multi. We always have umi for summer shoes. They are the best. I love the Elain shoes...so cute! I would pick the zander! Belair is so cute! Thanks for the chance! I think I'd probably get the Moabb for my son! Really like the "Tala" pair! 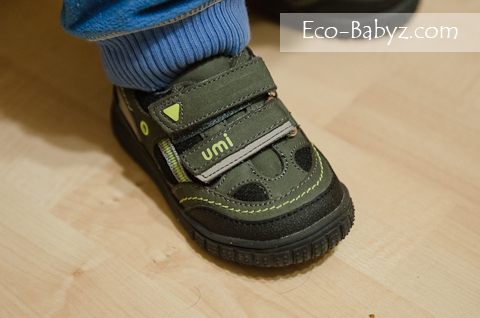 My son has one pair of Umi shoes and they are super adorable. I would get the Elain shoe in Coral Multi for my Charlotte! I would choose the Glena Shoes! I would love the Weelies for my 10 month old who will be starting to walk soon. Thanks for chance to win! I LOVE the Tala shoe! I love Halina and also the Giselle sandals. I would love to get the green Brogan xhoes for my son. I would apply it towards getting my grandson the Moabb hiking boot. I like Arabella girls shoes! I love the elaine with pink multi shoes for my granddaughter. they are soooo cute!! I like the boys weelie shoes! Love the Cassia Fuschia and navy baby shoes! So stinking adorable! I would pick the Morie F (ii). I would get the Moabb! I would get the Elain. I really like the Cassia shoes for my little girl. I like the Cassie in red. The Cassia in cocoa multi! 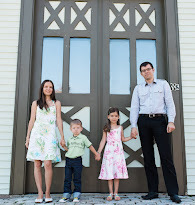 I love the Conners - I have a boy and two girls, so all colors were great! I like the Zander shoes! I would choose the pink multi Elain shoes. Maybe the Harlley sandals for boys. Giselle blue multi shoes are my pick! thanks! I'd get the Tala set for my girl. Wow these shoes are adorable! I think I would pick the Morie D.
My daughter would love Belair! I would pick the Morie! I like the little girls Halina B shoes in blue. I'd choose a pair of Trincy for my little girl. They're casual but can also be dressed up. I would choose the Kyraa bootie. I would choose a pair of Weelie shoes for my son. Since summer is coming, I'd choose the Carrter shoe in gray. I'd pick the Sammie cuz of the orange and brown. I'd love to get the Natalia Jr. shoes in Silver for my little one! 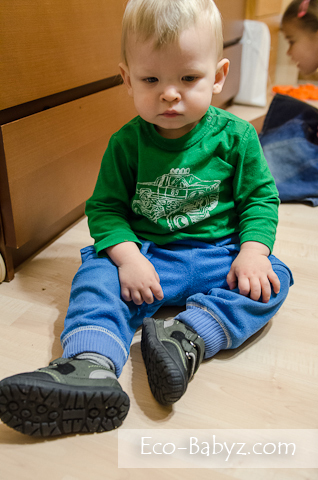 I woulg get the Carrters for toddler boy, in choc multi color. Thank you! I really like the Dersent Ii for my 9 yr. old! I would get the Natalia Jr. ones for my little girl, she loves all things shiny! The Orchid Etude shoes are adorable!! I would pick Zander for my son in the Navy and Yellow color because they remind me of Batman! I love the Natalia Jr. I like the Zander in blue.